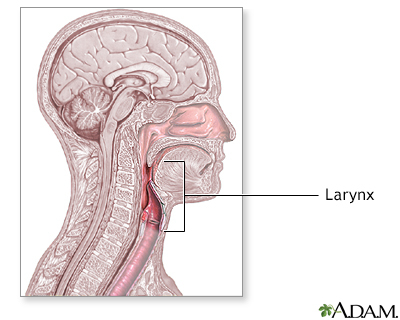 The larynx starts in the oropharynx, or back of the throat, and extends down to the trachea. It carries air from the mouth and nose to the trachea, and then to the lungs. 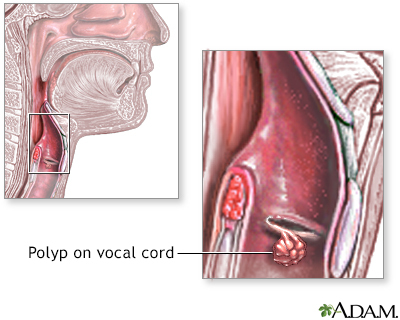 Growths, such as tumors, scar tissue, and lesions, can occur in the larynx. These growths often occur near the area of the vocal cords, which are located at approximately the midpoint of the larynx. 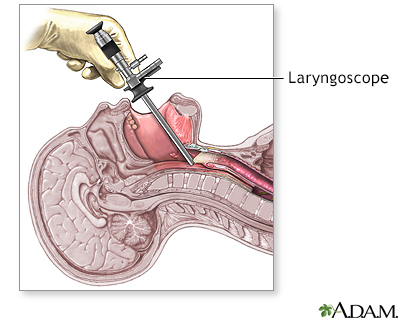 Laryngoscopy is a technique in which a rigid laryngoscope is directed through the mouth and down the larynx. The larynx can be viewed through the laryngoscope, and instruments can be passed down the larynx through the laryngoscope. While the patient is deep asleep and pain-free (general anesthesia), lasers are used to burn away tumors or lesions, which are passed down the laryngoscope. Patients can often go home the same or following day after laryngoscopy.